Bushnell is the leader in sports optics categories and is continuously exploring new technologies to maintain their dominant market share. The Bushnell Legend Ultra HD L Series binocular is where quality and style meets function and performance. The latest generation of Bushnell binocular incorporates many outstanding and unmatched features of today’s technology. Right out of the box you can see that the rugged construction of the L Series Legends contains precise mechanical details. The eyecup design combined with tethered objective lens covers assures accommodation for any user. The diopter adjustment is lockable, and the center focus wheel adjusts seamlessly. Overall, we like the feel of these binoculars, though they are a bit heavier and slicker than some comparable models. Bushnell’s patented Rainguard assures you will have the clearest view possible even in troubled weather due to the HD lens coating. These do a nice job of staying fogproof, and are weatherproof. These are another mid-price binocular targeted to bird watchers, hunters, and hikers. It comes in two color options (black or Realtree camo). Given the clarity and color resolution, these are great binoculars for any of those target users. 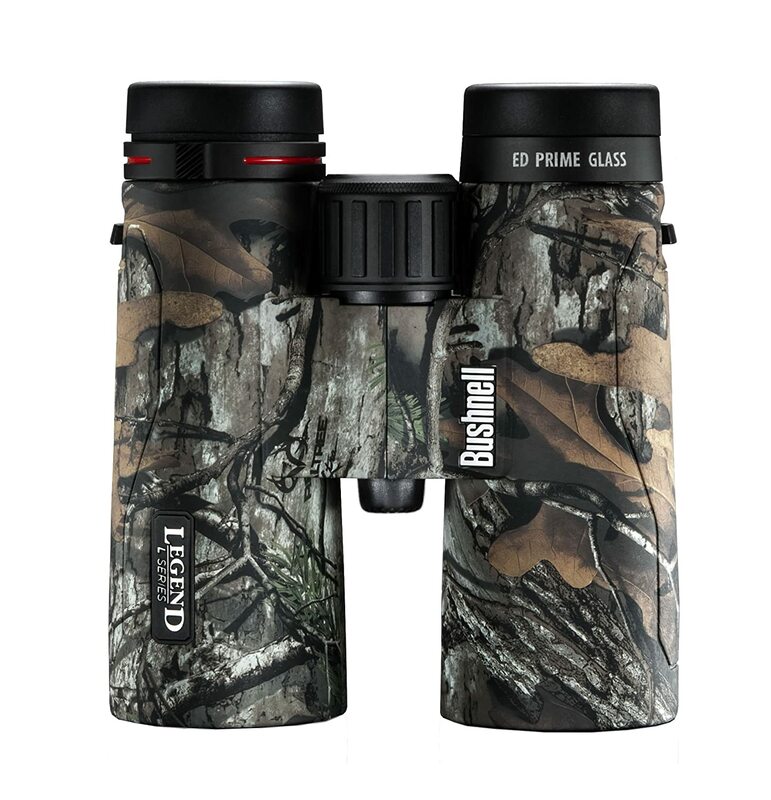 Many purchase these binoculars as their first pair, or first “good” pair, and are impressed by the quality and details. These are built to last, so you shouldn’t worry about needing to replace them anytime soon – these will definitely last. We tested these alongside some more expensive binoculars with similar specs. One of the key differences between the Bushnell Legend L Series 10x42mm and some of the other mid-range binoculars is price – the L Series is typically under $200. If you have that kind of budget, these are absolutely great binoculars. If you can spend a bit more, there might be better options (we like the Monarch 5). The Bushnells have great clarity and quality, but some of the other brands focus a bit better and have even better quality. These are also a bit heavier than some of the other mid-range binoculars, though not by much. The Bushnell Legend L Series 10x42mm is a good buy, any way you look at it. Plenty of reviewers out there say these are the best in comparison to some of the other similarly-priced brands, so (as always) it’s a matter of preference. We really like these and probably would’ve rated them a bit higher if we weren’t comparing them to binoculars that are a bit more expensive. With binoculars, like all optics, higher price does make a difference. If the Bushnell Legend L Series 10x42mm fit into your budget, you will not be disappointed. And, if this is your first pair of binoculars, or the first pair you’re putting money into, these will be everything you could hope for.